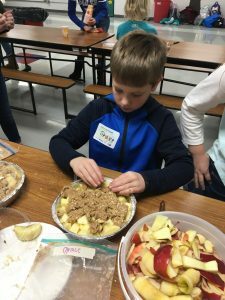 The November’s Kids in the Kitchen program theme was “Amazing Apple Snacks”; students prepared and ate Apple Nachos and made a take-n-bake Apple Crisp to enjoy at home. 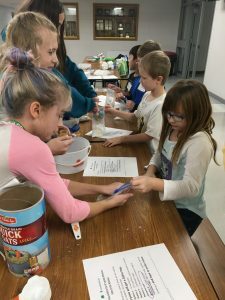 On November 27, Pepin elementary students had the opportunity to attend an after school nutrition and health event called Kids in the Kitchen. 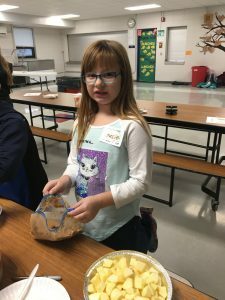 This program encourages healthy eating by creating a supportive environment for kids to prepare healthy and nutritious snacks for themselves. 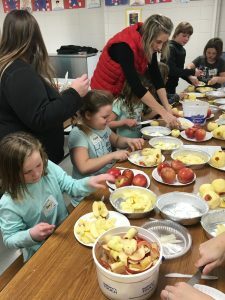 Empowering youth to make healthy lifestyle choices, such as choosing fruits and vegetables over less nutritious food and performing physical activities, can help reverse the growth of childhood obesity and other associated health issues prevalent in today’s youth. 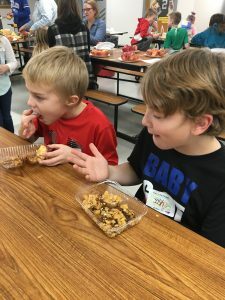 Mentoring is one important youth leadership component of the program. 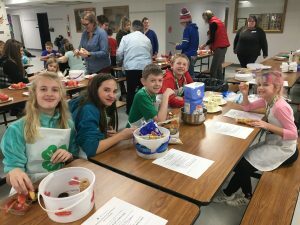 6th grade students served as the mentors to the younger grader participants for the Kids in the Kitchen program. 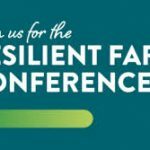 Research shows that having youth teach other youth builds feelings of social usefulness, self-confidence and a greater sense of responsibility. 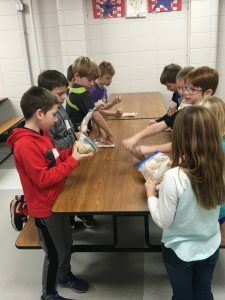 This mentoring element benefits all parties involved; the younger kids learn to make their own healthier snack choices and it provides hands-on leadership experiences for the 6th graders. 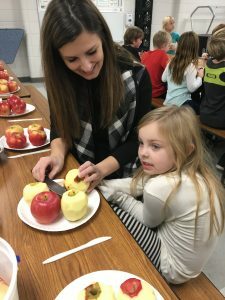 Another benefit from this program is how it encourages kids to prepare and try new foods while expanding nutritional variety to their diet. 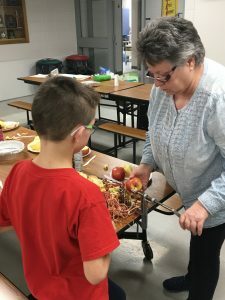 Students worked with the mentors to prepare the Apple Nachos and Apple Crisp. 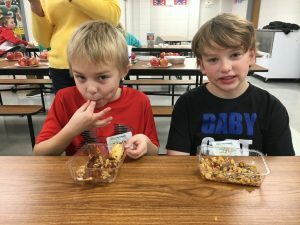 The participants enjoyed trying the different toppings on their Apple Nachos. 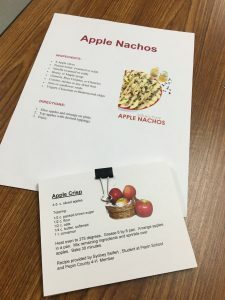 They learned that when you combine different healthy foods you can make a healthy snack that is very enjoyable and easy to make. 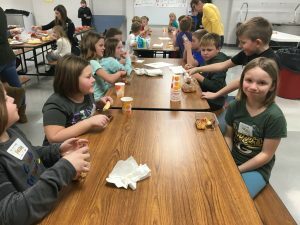 The program focuses in on the “My Plate” model for healthy eating. 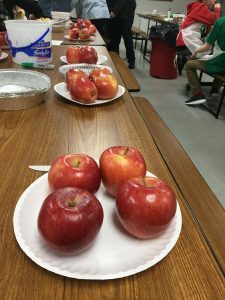 My Plate encourages people to eat a variety of healthy food in the following areas: fruits, vegetables, dairy, protein and grains. 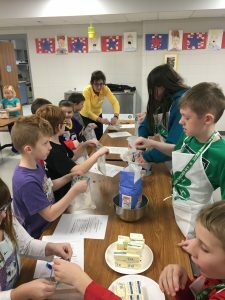 Marie Ritscher, Pepin County UW-Extension 4-H Youth Development Agent, coordinates the Kids in the Kitchen program. 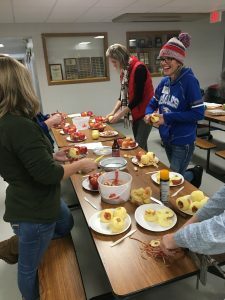 She works closely with Meg Ruff, Pepin County UW-Extension Program Assistant, Dean Behrendt, 6th grade teacher, Jill Riesgraf, Elementary Principal, and other Pepin School Staff to offer this engaging program. 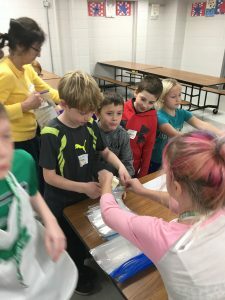 Kids in the Kitchen is part of the 4-H Smart Families UW-Extension program, which is supported by a grant through United Healthcare. 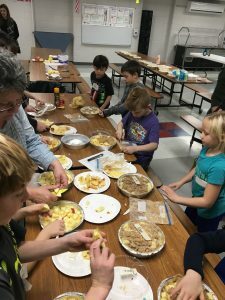 If you are interested in helping with the afterschool program, feel free to contact the Pepin School. 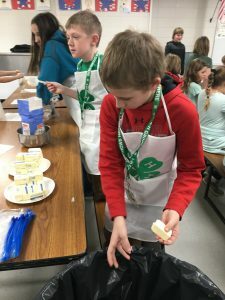 For more information about 4-H or a copy of the recipes, contact Marie Ritscher at the UW-Extension office, 715-672-5214.